To achieve more automation at Roberts Hardwood Flooring, System TM has joined the client’s existing machinery with a System TM optimizing Opti-Kap 5003 cross-cut line. Now, the company enjoys effective utilization of timber resources, increased manufacturing capacity, shorter delivery times and optimized business operations. Roberts Hardwood Flooring LLC is a NWFA certified mill that manufactures products of a long heritage of timber workers. Since its establishment in Mountain View, Missouri, in 1981, Roberts Hardwood Flooring has grown from two employees to approximately 100. Today, three generations of the Roberts’ family are directly involved in day to day operations. Roberts Hardwood Flooring runs its modern logging operations by automating wherever possible, purchasing reliable and powerful equipment, as well as replacing machinery on a regular basis. As a result, Roberts Hardwood Flooring provides its customers the highest quality hardwood flooring available while maintaining competitive pricing. At Roberts Hardwood Flooring, every single scrap of wood is used – literally. After logs are cut and dried, high-grade lumber is either transformed into hardwood flooring or shipped to furniture- and cabinet-makers in the United States and overseas. Wood of lower quality is converted into landscaping timber and pallets. Indeed, nothing goes to waste at Roberts Hardwood Flooring – even sawdust and woodchips are put on the market for sale. Roberts Hardwood Flooring has recently had a new infeed system and ripsaw installed, along with a System TM optimizing Opti-Kap 5003 cross-cut line. After being ripped by the ripsaw, rips are transported to the System TM and MiCROTEC optimizing cross-cut line. System TM’s machinery commences with an incline belt that leads workpieces up to a trimsaw and scanner feeder which feeds workpieces into the MiCROTEC scanner, Goldeneye 302. Upon scanning, the results are communicated to the optimizing software system, which dictates where the optimizing Opti-Kap 5003 cross-cut saw must position its cuts. After cross-cutting, workpieces are prepared by the existing side-matcher, which produces a consistent side matched pattern. Then, workpieces are processed by the end-matcher, which creates square end joints. Finally, workpieces enter the nesting and packaging phase, in which hardwood flooring is packed and prepared for transportation. 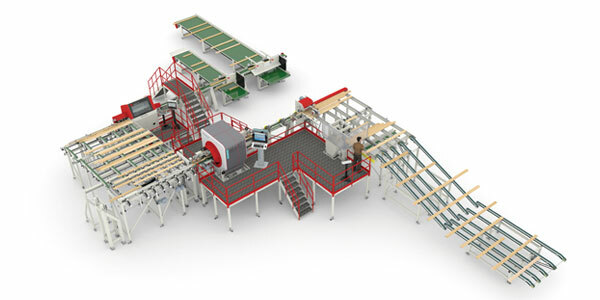 By coupling Roberts Hardwood Flooring’s existing machinery together with that of System TM, System TM has created a complete and integrated line of high-level automation and efficiency. As a result, Roberts Hardwood Flooring has enjoyed significant waste minimization and increased production capacity due to the integration of this line. The design and development phase of the Opti-Kap 5003 cross-cut line has moreover sparked expansion considerations for Roberts Hardwood Flooring in the future. This might involve adding another cross-cut saw to Robert Hardwood Flooring’s current Opti-Kap 5003 cross-cut line. A potential expansion would require few adjustments to the company’s existing machinery (side-matcher and end-matcher), as well as building in the second saw and corresponding distribution into the current System TM line.